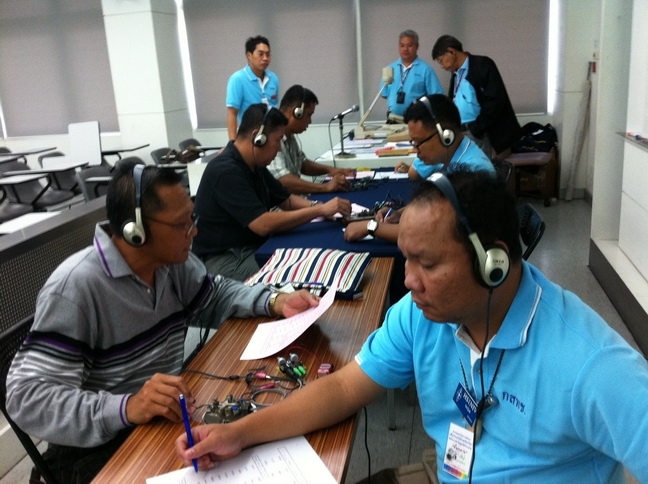 The first Intermediate Class amateur radio examination in Thailand for almost eight years (the previous exam had been conducted by the Post and Telegraph Department on November 27, 2004) was conducted at Bangkok University's Kluay Nam Thai campus on May 19, 2012 and went well with a total of 222 candidates registering to sit the exam while 151 candidates showed up on the day. 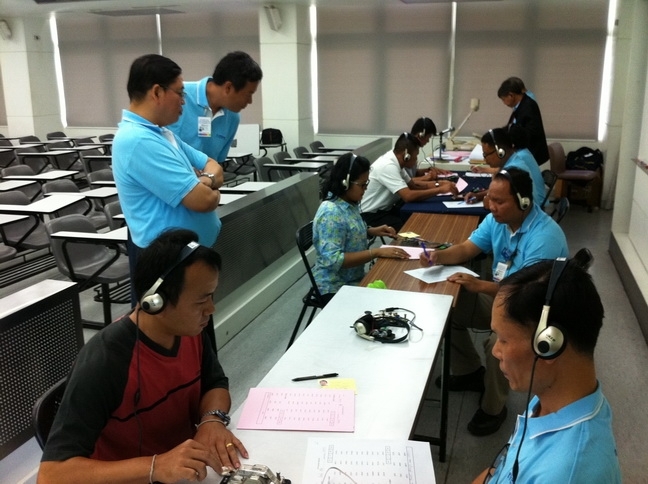 This Intermediate Class exam had been organized by the Radio Amateur Society of Thailand under the Royal Patronage of His Majesty the King (RAST) and took place at Bangkok University (Kluay Nam Thai campus) in three classrooms, each with 75 seats available, with the registration of candidates, all of whom were novice radio amateur operators, beginning at 8 a.m. and continuing to around 8.45 a.m.
By 9 a.m. the candidates were ready in the examination rooms with the first part of the Intermediate Class exam being to receive Morse code sent in English at eight words a minute with a total of 40 character groups and 12 groups of numbers sent. Before the test began, the examination supervisors sent the characters A to Z twice to familiarize the candidates with the audio tones and to help reduce tension among the candidates before starting the test -- although, for some, this may have increased their anxiety. For this Morse code receiving test, RAST had prepared a total of 10 sets of characters and the candidates in each room had a different set to identify. 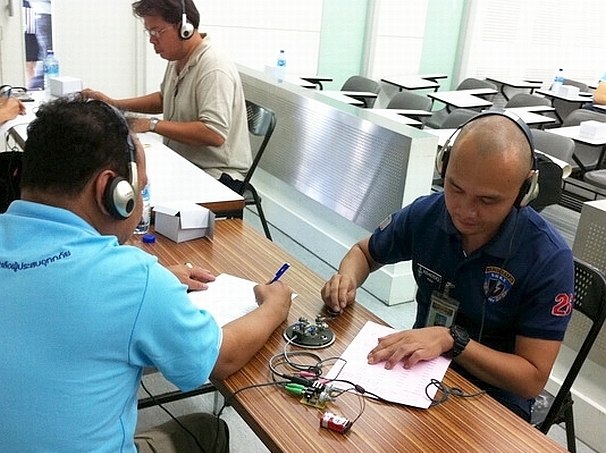 At 10 a.m. this was followed by the theory part of the exam and after supervisors had collected the candidates' responses to the Morse code test. The theory section comprised 50 multiple choice questions of which candidates only had to answer 30 correctly to pass and all these questions were in accordance with those published in the Intermediate exam handbook that had been made available earlier by RAST. Around 10 sets of questions had been prepared and each row of candidates received a different set of questions from those in adjacent rows. The theory part of the exam lasted for an hour and a half or until 11.30 a.m.
After the theory exam there was a break for lunch for the candidates who had still to take the remaining part of the exam in the afternoon while the supervisors and invigilators who were both staff from the secretariat of the NBTC and from RAST were reviewing the responses to the Morse code receiving test. I would like to say that the examiners from the NBTC and RAST were keen to see every candidate pass in accordance with the rules and enjoyed marking the papers very much. However, some candidates had made mistakes with just one character -- but in each of six different character groups and in order to pass they needed to not have more than five character groups with errors and this had caused the examiners to review and recount the mistakes again and again and it was with heavy hearts that they recorded mistakes in six character groups in these cases. 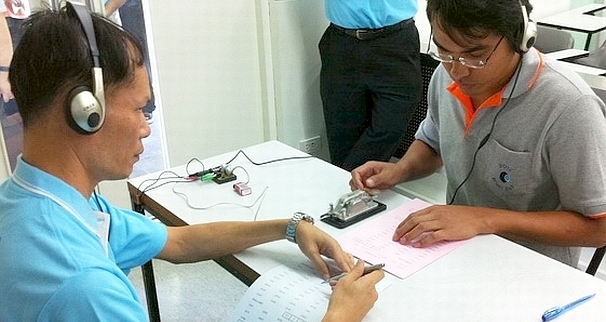 Morse code receive test is that in two or three papers candidates had written down every character group, but not a single group was correct while some had made correction marks. I would like to emphasize that Morse code is a skill and a skill needs to be gained through practice. Simply memorizing it is not enough to help you to pass. To summarize, Morse code is not difficult but you can't second guess it. There were three examiners to review each answer sheet, one from the NBTC and two from RAST, and all three examiners had to sign each page of the candidates' responses. At 1 p.m. the results of the Morse code receiving test were announced with a total of 43 candidates passing this, being 14 in Room 1, 13 in Room 2 and 16 in room 3. Then there was a practical test to send Morse code at a speed of eight words a minute with 40 character groups and 12 letter groups, with this taking place in each of the three examination rooms and with four candidates sending Morse simultaneously, so a total of 12 candidates were demonstrating their capabilities at a given time. For sending Morse, NBTC officials invited four candidates into each room while the code groups used were selected at random from a total of 10 sets so that it was certain that each candidate had a unique set of characters to send. Taking this test to send Morse code is special and is part of the essence of stepping forward to become an Intermediate Class radio ham and I regard this examination to have been a classic occasion on a global scale since those who passed could be proud that they were among a few such qualified persons since Thailand is one of not many countries that still have a Morse code requirement for amateur radio operators. I saw many nervous people, which is understandable since these were the symptoms that the supervisor in front of them had once felt when he had been just like them and it is certain that every supervisor well understands the mental state of the person who is about to take the test. I heard many supervisors saying "take a deep breath, be calm and send when you are ready" while many candidates were showing symptoms of fear with shaking hands, taking shallow breaths and perspiring profusely. Many candidates had practiced well but still had the possibility of failing because of anxiety. But everything went well for 43 persons who passed the test to send Morse code in line with the principles of "good, moderate or enough." Indeed, no one failed this test. oversee the exam, these being HS1ASC, HS1CHB, HS4RAY, HS4SCI, HS4SSP, HS0VDX, E20GJW, E20NKB along with a team from RAST comprising HS1FRU, HS9CGJ, JA1WTI, HS0ZCW, HS0ZFZ and HS0ZJI. It was a special feeling that is very difficult to describe when I heard the sound of Morse code being tapped out simultaneously from four keys in each room and this created joy in the hearts of many of the invigilators who stood behind the candidates listening to them. I noticed that all of them were smiling with true pride and I also saw the face of Mr Anant Chuaycharb from the NBTC who has overseen exams for many years, including for me as well as for many others 10 years ago, and he was also smiling with pride as well. Today, the NBTC secretariat has just three officials who know Morse code. 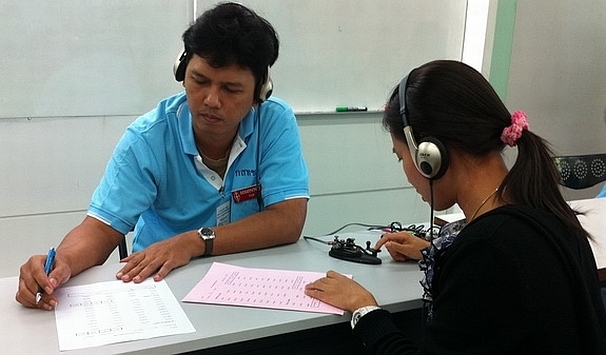 I would also like to praise three women who passed the Morse code practical test, one of whom was from Prachin Buri province who remarked to me with joy and in tears: "I had never sent Morse before and now I have done it." May I offer her my congratulations. Class examination, it is expected that it will be conducted towards the end of this year or early next year. Finally, for those who failed one part of the exam, please go back and prepare to retake it since everyone has the opportunity to move forward to become an Intermediate Class radio amateur. Don't be discouraged. Passing this examination to receive an Intermediate Class certificate is easy -- but is just the first step in assuming a leading role on the HF bands, which is more difficult than passing the exam itself. As for the new Intermediate Class radio hams among the 43 who passed the Morse code test, whenever you get on the air you will meet those people mentioned earlier for certain and when you have received your Intermediate Class license please let me know in order to obtain a free copy of the book "Guidelines for HF Operating for New Hams." Let's meet at the ceremony to award the Intermediate Class license to be presented by the Chairman of the NBTC at the office of the Secretariat of the NBTC!